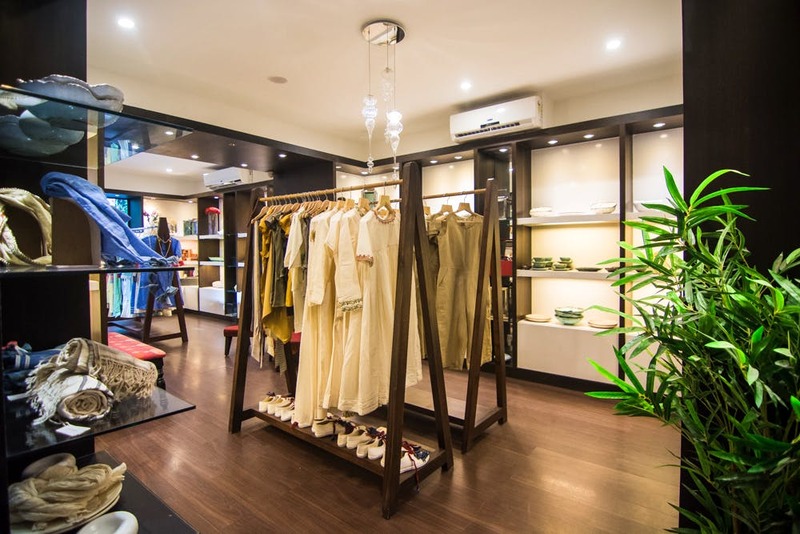 Exquisite home-dècor items, swanky home accessories, gorgeous outfits, some of them even vintage, crockery etc- you can find it all at Paashh, a luxury multi-concept store in Kalyani Nagar. What is different you ask? All the pieces you find here are totally organic and sustainable. Situated in a quaint bungalow, Paashh store is all about luxury and elegance. The ground floor has this store while the first floor has a cafe. With wooden flooring and golden lighting, the place has a royal appeal. Owned by Vaishali Karad, Paashh has everything made of eco-friendly products and tries to promote the concept of sustainable fashion. Let's talk about clothing and accessories. From tunics to dresses, tops to lehengas, we are in love with their sustainable fashion collection. Made of handloom and pure linens, these gorgeous sartorial pieces are sheer beauty. Starting at INR 700, you can find gorgeous scarves. You can also find pretty mojdis as well. Ladies, up your fashion game with beautiful kurtis and tunics. They also customise bridal lehengas. As far as the home accessories are concerned, they are elegant too. The crockery was fancy, eco-friendly and came in Eastman colours. The best part is that they also use the same crockery in their cafe. There are other home accessories as well that will add class to your space. From cake stands to fancy vases, artefacts to candle stands- these products are vintage chic. While your home decor game is fully up, you are also not harming the environment. Once done with shopping, you can head upstairs and enjoy superfoods and organic delectable products.